I’ll show you few tips of how you can have your wallet secure and in a safe place, there are many ways to add an extra layer of protection and no one is 100% secure but at least it will take more work to break it to hackers or people who will try to steal something they’ll find out that first aim those who has no extra layer of protection, for example put a copy your wallet.dat file in another folder in the same computer you run your wallet. As a reminder this information is only for those who keep their wallets in their personal computer or laptop and not through a web site (who might vanish someday with your money like Mt. Gox). Here is one of the easiest ways to add an extra layer of protection to your backup. 1.- Pull a copy of your wallet and encrypt it. 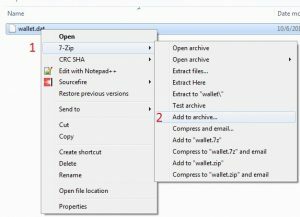 (If you don’t know where to find the wallet file take a look here Backup your wallet). 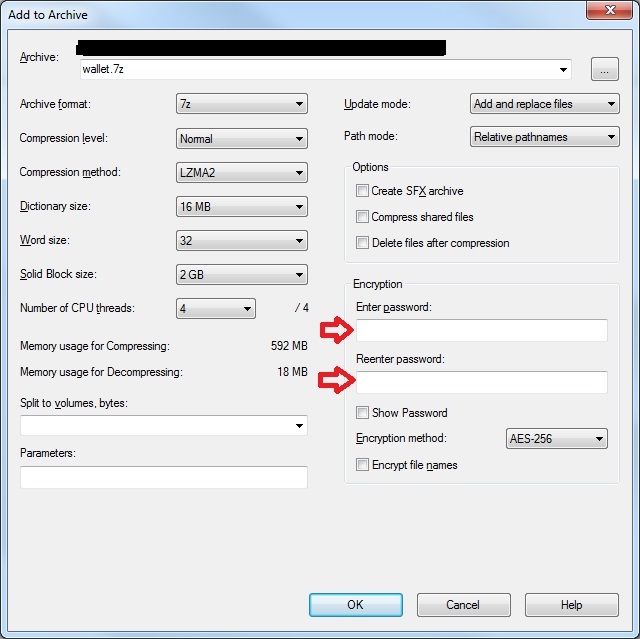 2.- Put the backup wallet “encrypted” in a usb flash or external HDD. 3.- If you own a gmail account (if not get one) you can send an email to yourself and attach the encrypted wallet, this is very secure because whoever may attempt to steal it, they have to be very good to break into google security by hacking their email system and once they get the file they have to deal to decryption of it and then finally have to figure out the private key (the password of the wallet). 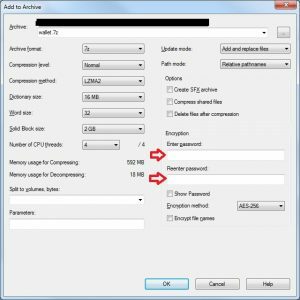 Now I’ll show to you step by step how to encrypt it, for encryption I basically zip the file using 7zip compress program which comes with a feature of add a password to the compression which basically does is to… encrypt the file. 1.- Get 7zip from the official site here 7-zip and install it. 2.- Once installed just go to the wallet file (i.e. 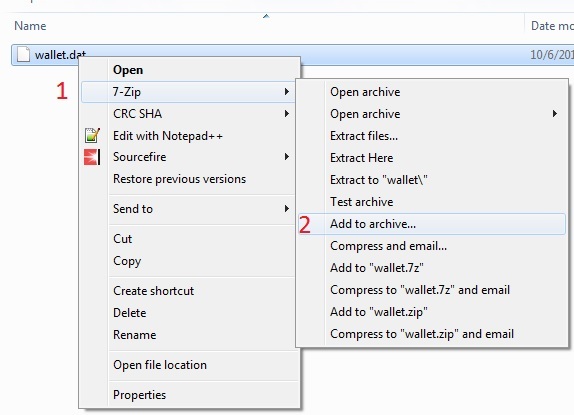 wallet.dat) file and do right click to it and it will show a menu with the 7zip options, we choose “Add to archive…” and new window will pop up. 3.- Now select the compress format which is “7z” and check on the security box and prepare to enter the password which I recommend you use at least 8 alphanumeric characters and at least 1 special character and hit OK.
4.- You will see a new file created of type “7z”, now proceed to backup to another place as explained earlier. Check this diagram to have a better understanding of the components that are in place in order to get access to your wallet and possibly to take your money/coins out. 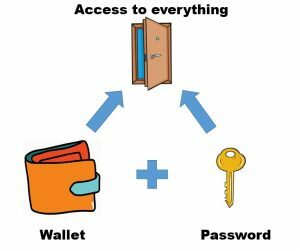 As you can see in the diagram hackers and robbers needs your wallet information and the password that’s why you never put them together. Remember that your wallet is always on risk when you are running a local node of the coin in your machine, so no matter where you put a copy of the wallet someone like a virus can take your wallet where your node is running and steal it. You must keep in mind that some coins doesn’t support password meaning you cannot encrypt the wallet like coins based on zk-SNARK technology like Zcash. The most important reason you want to backup your wallet in a secured way. 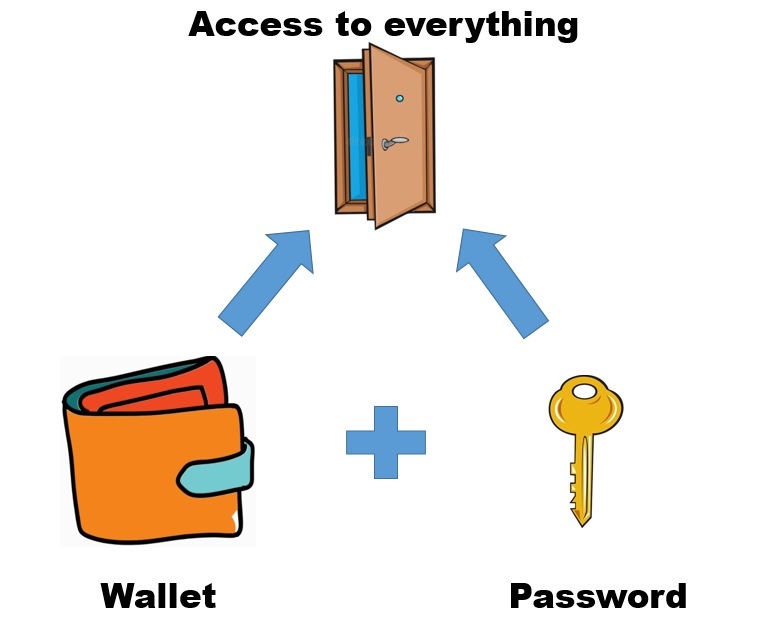 It’s because in any case of your machine burns, crashes, got stolen, lost completely there is no way to recover it which means you lose everything because you won’t be able to access your coins again, and this doesn’t apply only to the wallet info but to the password two, as you can see in the diagram you need these two components to get access to your money. Having your wallet somewhere else you are capable to recover access again to your money, and not just only imagine that you want to run your wallet in other machine you just have to import your wallet somewhere else. You might wonder how do I secure the password too? you may have read that you can put it down in paper but I don’t suggest to do that. Instead there are other ways to accomplish this in a secure manner and one of them is to use “Keepass” which is free and recommend you to take a look to this good and nice option. If you also wonder what if I’m using linux, you can install 7zip (called p7zip) and use it in similar way but only through command lines. Last thing make sure you backup your wallet on regular basis to make sure that all recent change addresses and all new addresses you created are included in your backup.